Painted Bookcase by William Burges. 1867. Height 72 inches; length 60 1/4 inches; width 13 3/4 inches. Ebonised wood, the upper part with double doors gilded and painted with a processional freize of figures personifying the signs of the zodiac. Pre-Raphaelite furniture — painted furniture of the mid-Victorian period — was an answer to what Burges called the "dark ages" of Georgian joinery. It was developed between 1855 and 1862 as a style of furnishing appropriate to High Victorian Gothic. Morris, Webb, Rossetti and Burne-Jones were involved in the production of some of the earliest pieces, in Red Lion Square, London, and at 'Red House', Bexley. But it was Burges, above all, who opened up this new dimension in English furniture design. In 1859 he exhibited six pieces, two of which — the Yatman Cabinet (1858) and the Wines and Beers Sideboard (1859) — are now in the possession of the Victoria and Albert Museum. In 1862 he exhibited three more items, including his own great bookcase (1859-62, altered in 1878), now in the Ashmolean Museum (on loan to the V & A). He explained that his furniture differed from that also exhibited in 1862 by Morris & Co., and by Prichard and Seddon. Prichard and Seddon's consisted principally of marquetried oak with inset ornament and painted figure-panels. That produced by both Morris and Burges was usually of pine or deal, painted all over. But Morris's furniture had as its "general characteristic ... an Eastern system of diaper combined with rather dark-toned pictures . . . (of) the Venetian school of colour"; and it resembled a type supposedly "used by the middle classes in the times of our forefathers." Burges's furniture "would have been found in the houses of the nobility"; its "tone of colouring (was) much brighter . . . (with) the literature of Pagandom and the Middle Ages ... side by side." As the Art Journal put it, tongue in cheek, it was the sort of furniture "Piers Gaveston might have ordered, had his London residence been in St. James's Square." One result of the 1862 Exhibition, as far as Burges was concerned, seems to have been a commission to design a particularly elaborate bookcase. When the firm of Morris, Marshall, Faulkner and Co. had been founded in 1861, it was C. J. Faulkner who kept the books. Eventually, in 1865-9, Faulkner was replaced by a musical enthusiast from the West country named Warington Taylor (d. 1870). Taylor had been at Eton with Swinburne; became a Roman Catholic and been disinherited; and had been reduced to working as a check-taker at the opera. Late in 1862 he makes a brief appearance in Burges's diary, introduced perhaps by E. W. Godwin. Then, in January 1863, appears the crucial clue: "Taylor bookcase". At exactly the same time, 1862-3, Burges included in his notebooks a slight sketch for a processional frieze including a study apparently based on the German legend of a tailor riding a goat. This may have been a preliminary draft for Taylor's bookcase. 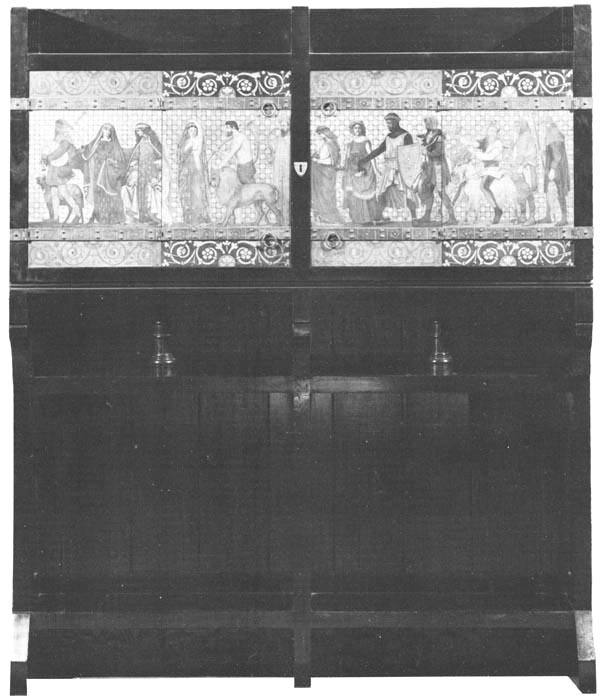 The result certainly combines elements associated with Morris and Webb as well as with Burges and Godwin: massive double-doors with counter-charged borders, fringed with iron, painted with a procession on a gold ground allegorising the Signs of the Zodiac, and mounted on a turned, ebonised stand. Early in 1863, the name 'Leighton' also appears among Burges's visitors. Could Leighton have been the artist responsible? In 1853 Burges had helped Leighton with his Cimabue procession in Rome. And 'Cimabue' was exhibited in 1862. On the other hand, Taylor was himself in close contact with Red Lion Square: he already preferred Webb's furniture to that designed by Burges, and in October 1862 he persuaded Rossetti to supply him with some "superb"* painted panels. Could these be the panels for Taylor's bookcase ? There are several possible hypotheses. By 1863 at least a dozen artists had painted furniure for Burges, including E. J. Poynter, Stacy Marks, Frederick Smallfield, Henry Holiday, Simeon Solomon, N. J. N. Westlake, D. G. Rossetti and E. Burne-Jones. Judgement is perhaps best suspended until further documentation comes to light. (*The group of letters from Warington Taylor, which include mention of the Rossetti panels will be referred to in detail in Dr. Crook's forthcoming book, William Burges and the High Victorian Dream (John Murray)). Crook, J. Mordaunt. "Two Pieces of Painted Furtniture by William Burges." Morris and Company. Exhibition catalogue. London: The Fine Art Society with Haslam & Whiteway Ltd., 1979. No. 4.